Biotin for Hair Growth - an ideal treatment for hair loss and regrowth plan? You are here: Home / Beauty / Biotin for Hair Growth – an ideal treatment for hair loss and regrowth plan? Is Biotin an ideal treatment for hair loss and regrowth plan ? and Best Biotin for Hair Growth. When we hear about vitamins for healthy hair growth, we often think about biotin as the first one in the top best vitamins for hair. However, there are not many people aware of exactly what it is and what benefits we can get from using it reasonably. Let’s widen your knowledge of biotin through this article. 2.10 Is Biotin an ideal treatment for hair loss and regrowth plan? 3 How to choose the best biotin supplement? 3.5 Where Can You Get Biotin? Biotin is a water-soluble compound and also known as B complex vitamins or vitamin H. It plays an important role in metabolism, supports your body to process energy as well as transports carbon dioxide from your body's cells. Especially, biotin can help grow healthier and stronger hair many women have desired to get by using a more natural approach. According to a Harvard’s study, biotin is one of the essential vitamins for enhancing hair strength, texture and growth. On the other hand, Biotin deficiency can cause dermatitis, decreased appetite, tiredness, mental confusion, loss of pigment in hair, or alopecia. However, Biotin deficiency is rare. It usually occurs to people with metabolic disorders, epileptics, athletes, elders, and people with their removed gastrointestinal tracts. Besides, pregnant or nursing mothers also have lower levels of biotin because of increased demand for the vitamin in their bodies. Research shows that among the factors making biotin important to healthy hair, metabolizing fatty acids and amino acids play a key role. Because hair strands are greatly consisted of a protein called keratin, the metabolization of amino acids - the compounds that make all protein, is essential for producing beautiful and healthy hair. Biotin is known as a B-complex vitamin that helps nourish hair follicles. Therefore, biotin deficiency can diminish the development of the cells forming hair follicles. Although it is not commonly encountered; it may develop in those who consume large amount of alcohol and keep a poor diet. Biotin deficiency causes abnormal metabolism of fatty acids, which possibly leads to hair loss, unexplained hair breakage, and thin, brittle, splitting hairs. When hair becomes unhealthy, it can be fragile, break easily and fall out. By taking biotin, you can maintain healthy hair, and reduce hair loss. According to the American Pregnancy Association, some females might get hair loss during and after pregnancy, and biotin can deal with this problem. Alopecia or hair loss can have a devastating impact on someone's mental health. Biotin has been utilized to treat both children as well as adults suffering from alopecia. When combating conditions like alopecia, biotin is the most effective when used in combination with topical clobetasol propionate along with zinc. Experts suggest that taking about 5 mg of biotin under supervision of a physician helps prevent further hair loss. Besides oral intake of biotin supplements to deal with hair loss, topical products are available for use. Biotin and hair growth are really related. It is effective in promoting hair to grow longer and faster (healthy hair will allow each strand to reach the end of its growth cycle without breakage and less damage). This vitamin helps hair grow, but results might be different for each person, especially if you don’t take it continuously. Moreover, you have to understand that although biotin is useful, you won’t see the difference overnight. It takes about a month or so to enhance hair length. Even if your hair doesn’t grow quickly after using it, you still receive some other benefits for eyelashes and nail growth. The hair follicle is in the dermis and plays a main role in maintaining stem cells which regrow the hair in case it falls out. When hair follicles get blocked with skin flakes, they prevent the hair growth process. Meanwhile, biotin helps with dry and flaky scalps that possibly causing hair loss. ​For people suffering from hair loss and thinning hair, extra doses of biotin can make their hair grow longer, thicker, and totally healthier. Biotin vitamins for hair growth increase the elasticity of hair’s cortex, helping decrease as well as minimize hair breakage. It also helps in anagen and categen phase which provide more sustaining nourishment. 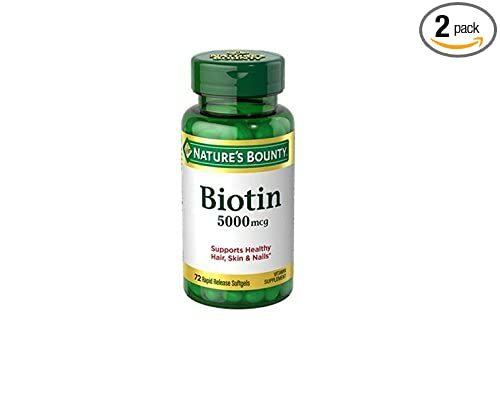 These biotin pills are considered as a great product for hair loss with reasonable price (at about ten dollars for a bottle). Each tablet contains 5000 mcg of biotin. This is good for people who are afraid of taking a handful of pills every day. At the beginning, it’s good to start with 2000 mcg of biotin a day and then you can gradually increase to 5000. Every week you can grow up your dosage by 1000 mcg until reaching 5000. This vitamin supplement stimulates carbohydrate, fat along with energy metabolism. It is said to make a real thick and healthier hair. Maybe, you even get growth in underarms, face, arms. Noticeably, when you take it, it is advised to stay hydrated. Since biotin is a water soluble supplement, that means a lot of water with it is important. If you don’t drink much water (6-8 glasses a day), biotin won’t dissolve and you may get skin breakouts too. For that unfortunate situation, downgrade to 1000mcg. If you like longer hair, I recommend you take it along with either vitamin A or E. This way, many people say that their hair grows 2 inches after one month. The capsules are small and easy to swallow. You should take it for at least one month before seeing any results. This brand of biotin is a great choice for vegetarian conscious clients. It is reliable and known for quality supplements. Solgar-Biotin is filled in vegetable capsules instead of gelatin like other brands. Solar products are in brown glass jars to decrease damage from light, oxidation, and moisture (generally a sign of a quality product). The product is good for women that suffer from postpartum hair loss or losing hair due to hormone fluctuations and aging stress. A number of people see a significant improvement, especially with their hair when using high-dose biotin. At the beginning, your scalp will tingle but that is a sign of hair growth. You should refer to your healthcare practitioner before having any drugs or dietary supplements, especially if you are pregnant, lactating or have a medical condition. It is good they have those available in 5000 mcg. 5000mcg would be considered a high dose of biotin. Some people just take one per day but others prefer two. This supplement is a great selection for those who just begun a biotin regime with 1000 mcg capsules and also a great solution for vegetarians (no gelatin). It’s good for your body to gradually assimilate and absorb the biotin effectively. Natrol Biotin 1000 mcg seems to be a high potency at a fair price. Start at 1000 mcg once a day for a few months and then take 2 a day, after that you can gradually rise up to a higher dose (5000 mcg). It includes Cellulose, Natural Strawberry Flavor, Xylitol Gum, PVP, Silica, Beet Root Powder, Malic Acid, Stearic Acid, Magnesium Stearate, Maltodextrin, Modified Food Starch, Citric Acid and doesn’t contain milk, fish, crustacean shellfish, egg, peanuts, tree nuts, yeast, soybeans, artificial colors, flavors or preservatives. Many claim that they love this delicious, strawberry flavored tablet. Be aware that biotin cannot distinguish between your head hair, eyebrows, underarm hair, leg hair, so you should prepare for an increase in those as well. Last but not least, this product has a smaller tablets than other brands, so it is easier to swallow. These pills add shine to hair while greatly helping reduce hair loss. After one week, your hair may stop falling out. The product’s price is more reasonable than other big brands. The dosage is only one per day as directed, so one bottle will last about 4 months. Moreover, tablets are small and smooth, so it is easy to swallow. Even if your biotin levels are normal in your body, you’re likely to get a biotin supplement to promote quick hair growth. Instead of using chemical products, why don’t you try out natural ones like biotin supplements? In rare situation, some people who use this product might have headaches, irritation or discomfort. Stop taking if there is any of these symptoms happening because it may not be the appropriate product for you. Incite Nutrition Biotin will be a good choice if you like biotin capsules. Its ingredients are biotin, vegetable cellulose, calcium and rice flour. A bottle contains 200 pills of 10,000 mcg per soft gel capsule, that is a lot more than some other brands. It will last over 6 months, so you just need two bottles for a year. After two weeks, you may notice a little difference in your hair. And after taking it long term, your hair won’t fall out more than normal and be much healthier and shinier. For those who hate pills, the capsules don't have any taste or smell; moreover, they are small so you can get them all down fast. Each bottle has 120 capsules at a 10,000 mcg dosage, which is the optimum of biotin daily guaranteeing faster hair growth. Moreover, it is in powder form which will absorb quicker than a hard tablet. The capsules are normal-sized and easy to swallow with no vitamin smell or taste. This is an affordable supplement to enhance hair growth, decrease hair loss, and make it fuller and beautiful. Moreover, people having eczema will be happy since it provides eczema relief, too. Every bottle of the product has 120 pieces of vegetarian soft gels capsules at a good dosage of just 5000 mcg. This biotin supplement is all-natural, preservatives-free, gluten-free, non-GMO, and without stearates or soy. It gets thousands positive reviews on Amazon. Your already damaged parts of hair will grow out and new healthier, thicker, and shinier hair will start to take over after a few months. Great amounts of biotin can lead to breakouts for some people. If you get acne prone skin, you may breakout. So, drink a ton of water every day along with zinc to avoid this. High dosage can also make some have stomach discomfort. You should always take it with food and consult your doctor, especially when you are pregnant, nursing, or on medications. If you are searching for long, shiny and beautiful hair, it is time to consider such good biotin supplement from Tobias. This product really strengthens hair to help prevent hair loss and is rated effective by a lot of people. Apart from other brands, Tobias Phytoceramides is not only a biotin supplement but it also combines other useful substances like Vitamins A, C, D, E all of which are powerful anti-oxidants. It is in a 30-capsule bottle with 5000 mcg of biotin - A generous supply for a full month. When biotin, or anything in general, is ingested, your body aims to break it down, and this requires a great amount of water. Since biotin is a water-soluble vitamin, it’s more necessary to consume a lot of water each day (6-8 glasses a day) to make biotin dissolve easily and not to bring skin breakouts. Apart from aiding with hydrolysis, it’s also essential for roots to get a good amount of water saturation for hair growth. Taking biotin from foods is great, but it’s a bit difficult to track. Selecting a supplement having biotin is the more effective way to absorb biotin and you will also know the levels you’ve consumed. It is a simple and quick method, so take a pill once a day and wait for the result. Biotin is only one of many things speeding up hair growth and supporting the growth of healthy, strong hair. There are other good hair supplements in the market combining many nutrients that fuel body for healthy hair growth. Alcohol decreases the amount of biotin your body gets and also damages the vitamin B your body produces naturally. If you hope to keep all the benefits of biotin for healthy hair growth, just decrease your alcohol intake per week/month. Is Biotin an ideal treatment for hair loss and regrowth plan? Biotin and hair growth are related closely. As I mentioned above, biotin deficiency can be associated with hair loss (it can lead to abnormal metabolism which is likely to cause hair loss); therefore, you need to keep biotin level in your body high enough if you want to have thick hair. If you do not get enough biotin, you can even lose your eyebrows and eyelashes. Biotin is essential for cell proliferation especially skin cells, which is why it is as an effective tool in hair growth. Many people may think that skin and hair not relate to each other, but in fact skin cells play a key role in the health of hair follicles. Weak hair follicles don’t have the ability to retain hair, which causes hair loss. Improving the health of your hair follicles is a good way to produce healthy hair regrowth. Additionally, biotin increases the elasticity of cortex of a hair; therefore, it prevents and minimizes hair breakage. For those who are having problem with hair loss, taking extra biotin may make their hair grow longer, thicker and healthier. Hair consists of keratin – a form of protein. When you eat foods contain biotin, this vitamin reacts with cell enzymes and contribute to produce amino acids, which build blocks of protein. Combine biotin with hair loss vitamins and you will have fantastic effects on both hair regrowth efforts and hair loss prevention. But if you combine with vitamin B, the result seems to be greater. Biotin supplement is available with a recommended dosage of 500 – 1000 micrograms daily to treat hair loss. Biotin supplements work better than other products, they seem to have a more direct impact on your hair issue and show results quicker. Oral biotin supplements often provide more vitamin than topical products. In topical products, biotin is often combined with other known hair loss remedies like zinc. The daily recommended dosage of biotin is 30 micrograms to maintain healthy hair. However, if you want to increase hair growth by biotin, the dose should be much higher. It is usually recommended to take between 500 and 700 micrograms per day by physicians. The amount can increase to 1000 micrograms. It’s important to refer to doctor’s opinion to avoid overdosing. When you have signs like slower release of insulin, lower vitamin C and B6 levels, skin rashes, or high blood sugar levels you should think of biotin overdose and have urgent solution. Although biotin has strong impact on treating hair loss, you shouldn’t rely on it too much, because in fact there are different reasons that cause your hair loss. It’s important to discuss with your doctor about the underlying reasons before you run to drugstore to buy biotin or a dozen other additional supplements. The reason causing your hair will determine the way to stop it, stall or find an alternative way to deal with it. How to choose the best biotin supplement? Choose the product that provides more biotin among other ones at the same price level. For example, I﻿ncite Nutrition Biotin contains 200 pills of 10,000 mcg per soft gel capsule, that are 80 capsules more than some other brands. You can look up for anything you want to know on the internet. When you’d like to find out which products are best, check websites that provide ratings and reviews for these supplements. If they get a lot of positive reviews and many 4 or 5 star ratings, they are highly effective products. One thing you should remember is to buy products that contain biotin and consist of natural ingredients. They must not have gluten, preservative, or GMO that can harm your hair. Don’t just pick up some products with low price without concerning about the quality. You must be sure they are not made from artificial ingredients that can damage your hair and scalp, even make hair loss worse. If not, you’re likely to spend a lot more money to solve such problem. If after using a biotin product for one month or so and you don’t see any difference, you should stop, reread the label and ingredients again to guarantee you aren’t allergic to any of it. In addition, if you don’t trust the internet, see a hair specialist for recommendations. Tell him/her about your lifestyle, diet, family history or anything else that relate to your hair loss. He/she will recommend you products suitable for your condition. Where Can You Get Biotin? 1. How does biotin and hair growth work? There is a stage which is called the anagen phase in hair growth cycle. During this stage, your hair is growing about half an inch per month. And to make sure hair follicles are producing the maximum amount of hair, it’s crucial to provide your body the essential nutrients to flourish. Biotin supports the metabolization of amino acids, which build healthy hair. Hair strands greatly consist of a protein called keratin produced by scalp with amino acids. Without amino acids, you cannot achieve a long, beautiful healthy hair. This is the basic process of how biotin works for hair growth. Biotin not only helps with the production of healthy hair, it also avoids hair dryness, and reduces hair breakage by increasing elasticity. For those suffering from hair loss, taking more biotin might be effective because of the internal activities it promotes and activates. 2. Does biotin really work for hair growth? Biotin plays a task in producing healthy and thicker hair. However, there are other things to consider if you expect to create a good environment for healthy hair. They are a healthy diet, appropriate amount of exercises, low levels of stress, and plenty of water to enhance your opportunities of speeding up your hair growth. 3. Does biotin have side effects? Biotin is a safe and nontoxic vitamin which hasn’t been associated with any serious side effects if taken by mouth as direction. Because it is a water-soluble vitamin and excesses will be excreted in urine, the risk of biotin toxicity is very low. But you may get skin breakouts if you don’t drink lots of water during the time taking biotin. 4. Can women take biotin while they are pregnant or breastfeeding? Tell your doctor if you are pregnant, may be pregnant, or are breastfeeding. 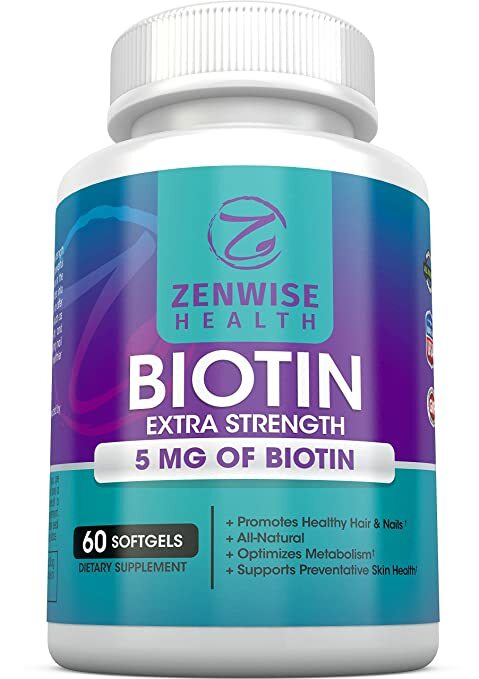 Biotin is possibly safe in these cases and even necessary for pregnant and lactating women to improve their health since they will be lack of biotin after pregnancy. Yet, you should still ask your doctor if you can take any supplements. 5. How many milligrams should be taken per day? Biotin’s common preparations in tablet form are 10 micrograms (mcg), 50 mcg, and 100 mcg. It actually depends on each one and genetics. Some people select a high dosage like 10,000 mcg while others select 5,000 mcg. The daily requirement recommended for keeping a healthy hair is around 30 mcg. However, if you want to increase the growth of hair, the dose should be much higher. It is usually suggested to take between 500 and 700 mcg per day by physicians. The amount can be up to 1000 mcg. Increase the dosage as time progresses, but it’s important to refer to doctor’s ideas to avoid overdosing. 6. How often should I take a biotin supplement? Actual results of thicker and healthier hair can be seen only with frequent biotin doses. Don’t take for few days, then stop and continue in other time, no results will occur. 7. How long do biotin supplements take to work? No good thing occurs overnight. Full results will start to appear about a month after taking the vitamin. 8. Will biotin interfere with my prescribed medication? Though biotin is a natural vitamin, some say that it reduces the efficiency of some seizure and heart medicines. In case you are getting any prescribed medicines, I’m highly recommended you to discuss any important dietary changes with your doctor. 9. What effect will biotin have on my skin? Biotin can usefully treat eczema, but it can also result in acne. However, this isn’t threatening. Acne is impermanent and not anyone gets this problem. So, to reduce acnes, boost your water intake while you are using biotin supplements. 10. What other physical changes may I have when starting a biotin routine? As mentioned, biotin can greatly enhance your skin condition in case you suffer from eczema. Moreover, your nails will also be stronger and healthier. Biotin breaks down fats, carbohydrates, and proteins, so you will get more energy from it. 11. I hate taking pills, what other ways can I take biotin? Biotin is a natural vitamin can be found in different foods like carrots, halibut, blackberries, strawberries, onions, cucumbers, chicken eggs, almonds, walnuts, goat milk, etc. But biotin supplements actually boost hair and nail conditions. If you really desire to improve your hair and nail growth, and feel your body needs extra biotin, a soft gel is a good way. Take one big gulp of water and you’re done! 12. Does the vitamin biotin (1,000 mcg) stimulate hair growth in older women with thinning hair? There is evidence suggesting that biotin supplementations may help keep certain components essential for healthy hair growth. This seems to be most evident with those having an abnormally low level of biotin in their body. Biotin supplements really help with thinning hair. The normal daily requirement of biotin recommended is from 35 mcg to 60 mcg. A dose of 1,000 mcg is excessive and you’d better only take this amount under supervision of a physician who will examine your medical history along with any disease stated as well as medicines being taken. 13. Is biotin a weight gainer? Seriously, no. Biotin supports healthy hair and nails and makes them thicker. 14. Does biotin improve facial hair growth as well? Since biotin is thought to help with hair loss, it promotes all hair on your body but facial hair isn’t too much, more on your head or private areas. 15. Is the result permanent? No, it's not. Biotin is a useful vitamin, and if you stop using it, your hair will still be healthy and thick. However, it'll possibly not last forever. You need to keep the biotin levels up by consuming foods like tuna, banana, carrots, peanuts, salmon, etc. that contain a really good amount of biotin. Besides, having a scientific lifestyle and a good hair care routine each day is necessary for you. 16. Will the rest of the hair on the body grow too? This question is also commonly wondering by many users before getting biotin as a treatment for their hair loss; the good news is “no”. The hair on our body is unlike the hair on our head, it gets a molecular signal to just grow to a certain length. This fortunately allows us to avoid having to cut our arm hair. I've recommended it to those who have suffered hair loss from different reasons, even because of stress or medical treatments. However, using too much anything all brings side effects, biotin is no exception. Remember to refer to a doctor before adding any vitamins to your body or using any type of supplements.